There is nothing more satisfying than a really good homemade Chocolate Pudding, one with a velvety smooth texture and deep chocolate flavor. I love everything about it and if you have always settled for commercially made puddings, than you are in for a treat. This homemade chocolate pudding is quite easy to prepare and what makes it so perfect is that most of the ingredients you will already have in your cupboards. Things like milk, cream, sugar, eggs, cocoa powder, and chocolate. And while some may think of puddings as old fashioned, when you serve this dessert in pretty bowls with a large dollop of whipped cream, there is no better way to end a meal. This chocolate pudding could be called a "double" chocolate pudding, as it gets its deep chocolate flavor from both unsweetened cocoa powder (regular or Dutch-processed) and semisweet (or bittersweet) chocolate. When you make a chocolate pudding what you are really doing is making a 'cooked' custard that contains cornstarch (corn flour) to make it thick enough to eat with a spoon. The danger zone with any pudding is cooking it over too high a heat causing lumps or even worse, scorching. To avoid these pitfalls use a heavy bottomed saucepan and cook it over medium low heat, stirring constantly with a large heatproof rubber spatula. Make sure when stirring you reach the bottom, sides and corners of the saucepan to prevent the pudding from sticking and scorching. As you cook the pudding it may look lumpy but if you stir quickly the lumps should smooth out. Once the pudding has become thick, like mayonnaise, remove immediately from the heat. Straining the pudding will help get rid of any lumps that may have formed. Once you have added the chopped chocolate, vanilla and butter avoid over mixing the ingredients as the pudding is quite fragile at this stage. If you like your chocolate pudding warm, then by all means eat it right away. But if you like your pudding cold, simply press plastic wrap onto the surface of the puddings and refrigerate until firm (a couple of hours). For those who like a skin (film) on the top of their pudding, let the pudding cool uncovered and then cover with plastic wrap and refrigerate. Note: You can make this chocolate pudding without the egg yolks. No other adjustments have to be made to the recipe. It may, however, take the full five minutes of cooking on the stovetop to reach the correct consistency. While leaving out the egg yolks doesn't really affect the flavor of the pudding, I find the texture not as silky smooth. 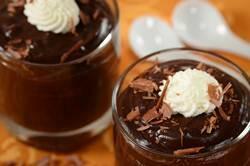 Chocolate Pudding: In a medium-sized heatproof bowl whisk together the sugar, cornstarch, cocoa powder, and salt. Then whisk in 1/3 cup (80 ml) of the milk to make a thick paste. Add the egg yolks and whisk into the cocoa paste mixture. Set aside while you heat the milk and cream. Have ready a strainer placed over a bowl as you will need to strain the pudding after it is cooked. First, rinse a medium-sized heavy saucepan with cold water and then shake out the excess water. Doing this step helps to prevent the milk from scorching. Then pour in the remaining 1 1/3 cups (320 ml) milk with the cream. Bring this mixture just to a boil (the milk will start to foam up) and then remove from heat. Gradually pour the hot milk into the egg mixture, whisking constantly, until the mixture is smooth. Transfer the pudding mixture to a clean, heavy bottomed medium sized saucepan and place over medium-low heat. Cook, stirring constantly, until the mixture thickens to the consistency of mayonnaise (about 3 - 5 minutes). Remove from heat and pour through the strainer to remove any lumps that may have formed during cooking. Add the finely chopped chocolate, vanilla extract, and butter, stirring gently with a rubber spatula until the mixture is smooth. Pour into 4 bowls or wine glasses. Can serve warm or if chilling, press plastic wrap onto the surface of the warm puddings to prevent a skin (film) from forming. If you like a layer of skin (film) on your pudding, simply leave the puddings uncovered until cooled and then cover with plastic wrap. Can be covered and stored in the refrigerator for a couple of days. Serve warm, at room temperature, or cold. If you are like me, no chocolate pudding is complete without a large dollop of softly whipped cream.